What do we mean by the security industry? Which companies are active in security? Why does the EU want to boost the security sector? How is the EU helping the security industry? We’ll continue to add new articles and fresh insights. body scanners, less-than-lethal weapons, consulting services, hacking software, surveillance equipment, fencing, communications equipment, and much more. We aren’t talking about the market for military products and services like fighter jets, tanks, satellites, and radar systems. 1. First there are Europe’s major defense contractors, which include BAE Systems, Finmeccanica (now Leonardo), Airbus, Saab, and Thales. After the fall of the Berlin Wall, these companies saw their sales shrink and started looking for new markets for their products and services. They believed that with a little tweaking, their military products could also have civilian uses. 2. Then there are the technology giants that have started developing security applications, largely since the 9/11 attacks. These include companies like Nokia and Siemens, as well as research institutes like Fraunhofer of Germany and TNO in the Netherlands. 3. Finally there are the small and medium-sized enterprises, or SMEs, that specifically target the civilian security market. These companies are often less well-known among the general public and include, for instance, Smiths Detection, Morpho, Group 2000, Trovicor, and Hacking Team. This category contains a large number of cybersecurity businesses. In 2012, the European Commission calculated this security market had grown by a factor of ten in only a decade. In the name of “creating jobs” and “stimulating the economy,” EU institutions have funneled increasing resources into the security industry. A smoldering sense of insecurity, fanned by terrorist acts, created the necessary political support. The economic research company Ecorys calculated in 2015 that this sector has an annual revenue of €200 billion and that the EU security industry employs 4.7 million people. The European Commission intends for much of this work and money to be earned by defense and security companies. But the Commission is also concerned about competition from the US and China. Certainly after the financial crisis, encouraging high-tech employment ranks high on the EU’s economic agenda. In addition, the Commission believes that new technology Here’s our interview about EU policy makers and their faith in markets and technological fixes (in English) is imperative De Correspondent interviewed a researcher on the EU’s technocratic approach (in Dutch). to protect Information published the same interview in Danish. Europeans. 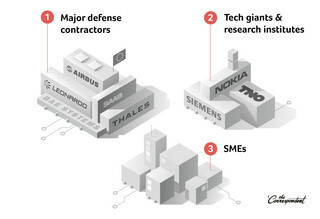 From the start, this dual interest – economics and security – has also been the main message promoted by the defense lobby, Knack looked into powerful security lobby (in Dutch). and later, the tech lobby. 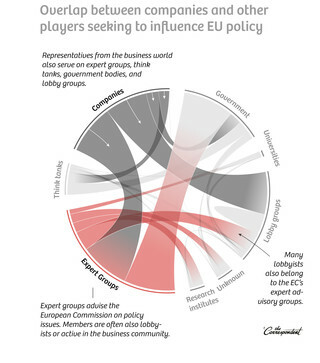 Since the late 1990s, those lobbies have managed to snag seats on a variety of advisory committees Read De Correspondent’s article on lobbying in Europe here (in Dutch). to the European Commission, European Council, and European Parliament. Primarily through subsidies, as our articles in Il Fatto Quotidiano, Read Il Fatto Quotidiano’s cover story here (in Italian). Knack, Knack kicks off its series here (in Dutch). Dagbladet Information, Here you can find Information’s coverage (in Danish). ZEIT ONLINE, DIE ZEIT, Read DIE ZEIT/ZEIT ONLINE’s coverage here (in English). and De Correspondent Here’s De Correspondent’s first Security for Sale article (in Dutch). reveal. And here’s De Correspondent’s launch article (in English). The major sources of funding are the FP7 and Horizon2020 “framework” programs for scientific research. On the advice of the lobby-slash-advisory-body Group of Personalities, the EU began funding research into security applications. Above all, that research needed to be applied and cutting edge, conducted by networks of companies, universities, end users, and research institutes. Companies received by far the most money. That’s not particularly surprising; these same companies were the ones influencing funding policy. In addition, subsidies are being granted to countries to improve their internal security, guard their borders, and strengthen their local and regional economies. Here, too, major defense contractors are often the beneficiaries. 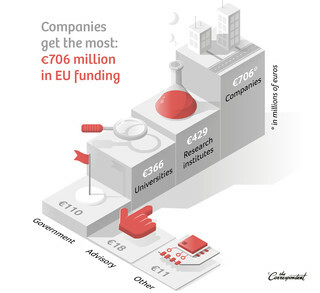 The EU’s research programs receive moderately positive reviews from their beneficiaries – that is, from the companies, universities, and research institutes that receive funding. Just over half of grant recipients feel the money received was worth the effort Knack asked EOS what they think of the research programs (in Dutch). and expense they put in. 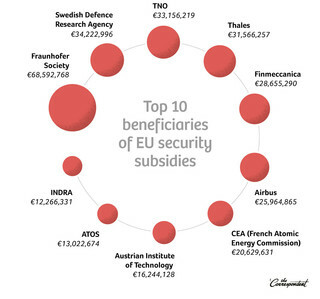 Policy makers now have greater faith in funding industry from EU coffers, and similar programs are being set up for cybersecurity and military research. What’s more, a lot of security technology has been developed since 9/11 that’s actually being used. Many airports have installed body scanners and started using biometric access control. The police and other government agencies are intensifying their use of drones, as in the arrest of the bombers behind the Brussels airport and metro attacks. Smart camera surveillance is being rolled out at more and more intersections to recognize people and identify suspicious patterns. Law enforcement and intelligence agencies are using increasingly preemptive methods, based on a plethora of data flows they decrypt. Finally, the European Union has taken on a much greater role in protecting civilian safety. The EU is developing technical standards so the industry can more easily operate in every member state. More information is being exchanged. More joint border checks are taking place, and to that end a bureau with extensive powers and resources has been created, the European Border and Coast Guard Agency. And law enforcement agency Europol and judicial cooperation agency Eurojust are being tasked with more and more duties. Though the research grant recipients are largely positive, it seems that part of the goal – making society tangibly safer – isn’t being achieved. Our investigation reveals that once their applied research concludes, funding recipients often take no further action Here’s ZEIT ONLINE’s piece on the terror airbag that never got made (in English). on the results. In part, that’s because the supply of these often very high-tech solutions doesn’t meet the needs of real-world security demand. Law enforcement and other security services simply aren’t looking for highly advanced and hard-to-implement solutions. What’s striking is that these end users are rarely included in designing the research projects. The solutions that do get adopted are often plagued by problems. In the EUROSUR project, for instance, the countries bordering the Mediterranean Sea attempt to monitor and curb migrant flows using a variety of technological tools. Though EUROSUR is often presented as the poster child for the research projects’ success, in reality it’s not working the way it’s supposed to. And yet at least €600 million have gone into this project. Many security devices aren’t ordinary products, because their use often conflicts with a number of civil rights. Significant research funding has gone to countries, such as Israel and Turkey, that certainly in recent years haven’t taken civil rights too seriously. Thirty Palestinian organizations, for instance, have protested funding for the Israeli company Elbit Systems. They argue that Elbit’s technology is being used against civilians in the Palestinian territories. Our investigation also reveals ARD Fakt on intel profiting from subsidies (in German). that the US National Security Agency, the NSA, De Correspondent on ARD’s report (in Dutch). is benefiting ZEIT wrote about it as well (in German). from European research funds. Many European countries peddle The same piece in Dutch. their wares to regimes Information on the investigation (in Danish). that have a disturbingly casual attitude toward these rights. Time and again, Knack reported on it (in Dutch)... European companies ...ZEIT in German... make the news ...as did Svenska Dagbladet (in Swedish). because they’ve sold surveillance equipment, Long Play revealed a new case (in Finnish). for instance, for use in Egypt, Libya, Syria, Ethiopia, the United Arab Emirates, Saudi Arabia, and other nations that have a poor reputation regarding human rights. These companies profit from the lack of strict European export controls. Actors in several countries lobby heavily to prevent such controls. And subsidised technologies made in the European Union, as our research proves, Information wrote about the UAE (in Danish). have also ended up in the United Arab Emirates. There’s another ethical issue regarding the role the big defense contractors play. On the one hand, they earn tens of billions of dollars selling weapons to the countries flanking Europe, thereby fanning the fires already raging there. On the other, they also earn billions of dollars setting up a variety of border control systems Watch the Backlight documentary (English). and security measures to curb the dangers and migrant flows VPRO on Europe’s shifting border (Dutch). caused by those conflicts. Finally, the EU is also shifting its borders to well beyond the continent. A variety of surveillance equipment Il Fatto Quotidiano on surveillance at sea (in Italian). is being developed by commercial companies, primarily for use in North Africa to prevent refugees and people with sinister intent from ever reaching Europe. Our investigation reveals that EU security policy emphasizes technology: a high-tech solution is being sought for a societal problem. EU and national policy makers are encouraging the use of what’s known as dual-use goods. These are products and services that have often been developed in a military context, then later adapted Here’s Information’s interview with a programmer who regrets developing spy software for civil use (in Danish). for use in a civilian environment. De Correspondent published the same interview in Dutch. At the same time, we’re also importing a security mindset from other countries. From Israel, for example, where EU policy makers have found inspiration in recent years. Many technologies and methods to monitor citizens have been thoroughly tested there. The question is whether this occupation-style policing is something we want to embrace. Reduce the focus on technology as a solution to security issues. Involve end users more in developing technology and other solutions. Listen less to industry and more to the social sciences. This industry is no ordinary sector; it needs to be strongly regulated. Regulate Here’s De Correspondent’s analysis of export regulations (in Dutch). exports much more strictly. Information asked experts how export regulation should change (in Danish). Shut out companies that are playing for both teams. And finally, don’t chase the latest hype when awarding contracts; look instead to long-term trends. Dimitri Tokmetzis, Maaike Goslinga, Leon de Korte (De Correspondent, the Netherlands), Shuchen Tan, William de Bruijn, Marijntje Denters, Nirit Peled (VPRO Backlight, the Netherlands), Christian Bergmann, Josa Maria-Schlegel (ARD, Germany), Christian Fuchs (DIE ZEIT, Germany), Kai Biermann (ZEIT ONLINE, Germany), Lorenzo Bagnoli, Lorenzo Bodrero, Luca Rinaldi (Investigative Reporting Project Italy in collaboration with Il Fatto Quotidiano, Italy), Craig Shaw (Centre for Investigative Journalism, United Kingdom), Leonard Wallentin, Katarina Lind (Journalism++ in collaboration with Svenska Dagbladet, Sweden), Kristof Clerix (Knack, Belgium), Sebastian Gjerding, Lasse Skou Andersen (Dagbladet Information, Denmark), Guillaume Pitron (freelancer in collaboration with Le Monde Diplomatique, France), Hanna Nikkanen, Johanna Vehkoo (Long Play, Finland), and Olaf Meuwese (volunteer and data expert, the Netherlands). Our investigation wasn’t informed by a leak or whistle-blower. We simply pooled our knowledge and formulated our own research questions and topics. We communicated primarily through secure email and chat apps, but we also met in person in Belgium, Germany, and the Netherlands. This kind of collaboration takes substantial time and money. Fortunately, the Journalism Fund awarded us a grant that helped finance our freelancers and our meetings. Other outlets have started picking up our coverage of the European security industry, including De Morgen (Belgium), HNL, VTM (Belgium), Radio 1 (Belgium), RTL, NU.nl (the Netherlands), and TV2 (Denmark).